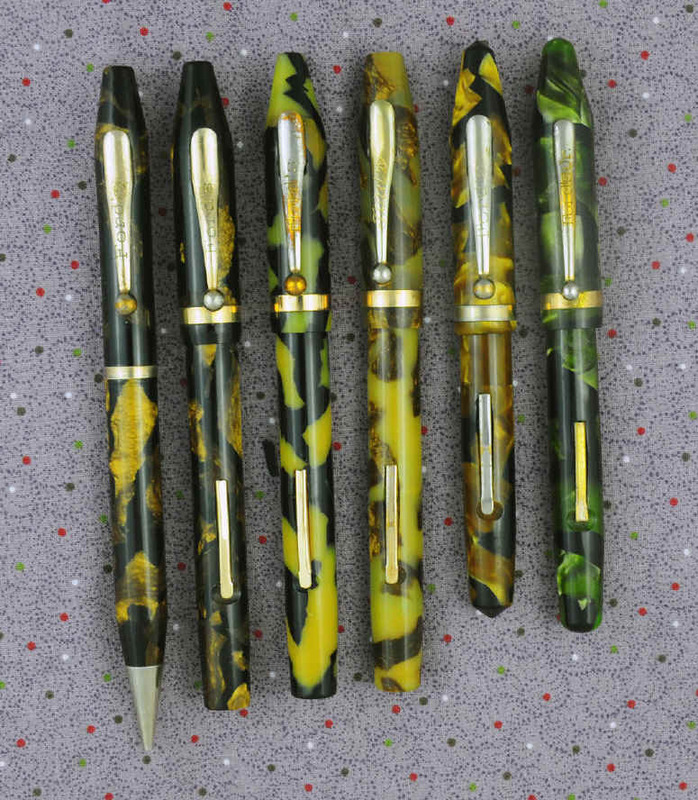 Here are my first five Ford's pens, one with matching pencil. All but one have the Ford's name in a block text font, while the third from the right has a script font much like the Ford Motor Company logo of the 1930s. That pen also has a slightly different taper to the cap than the two other standard sized pens to its left. 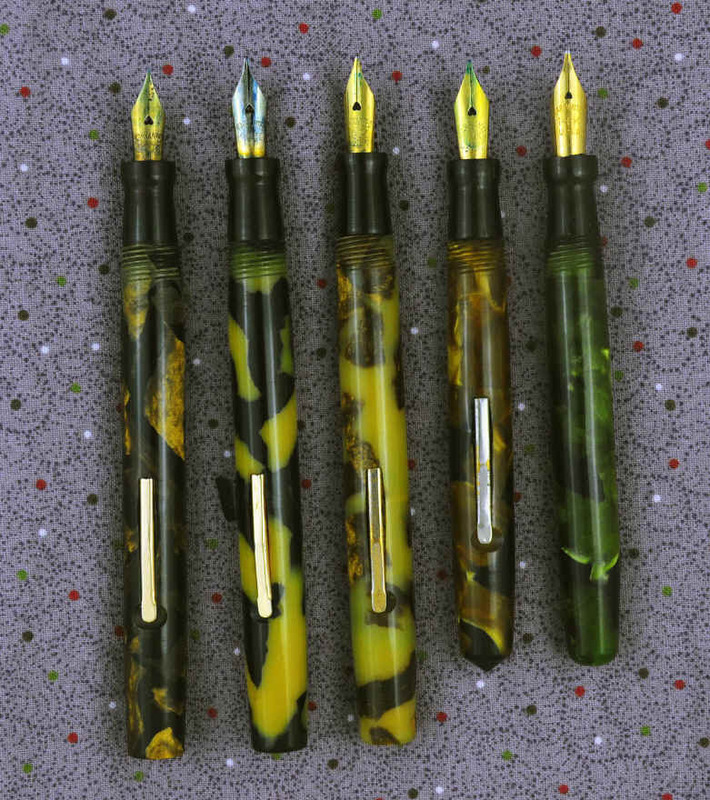 The green one on the right is labeled Ford's Jr.
All of the pens appear to use the same section, feed, and Warranted 14K number 4 nib. 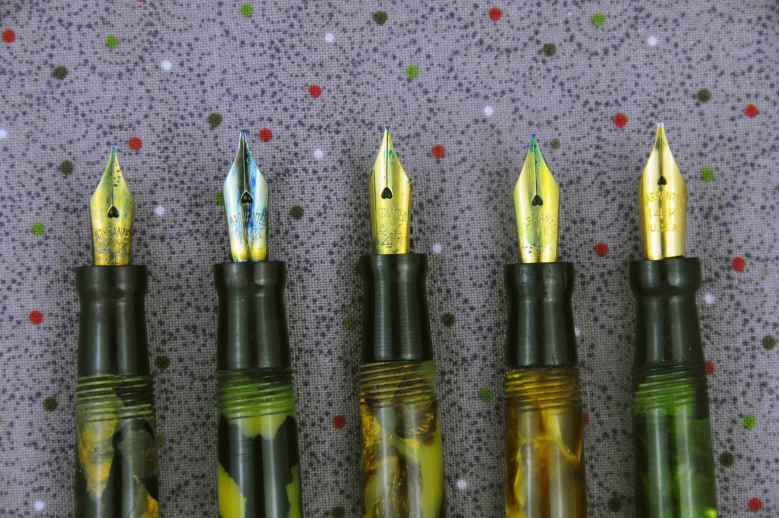 The nib on the green pen is not original, but the other four are essentially identical. It's interesting that the caps on the two smaller pens are somewhat longer than those on the larger pens. I do not know who manufactured or sold these pens. If anyone visiting this page has any information, I'd like to hear from you. I've added two more Ford's writing instruments to my collection. 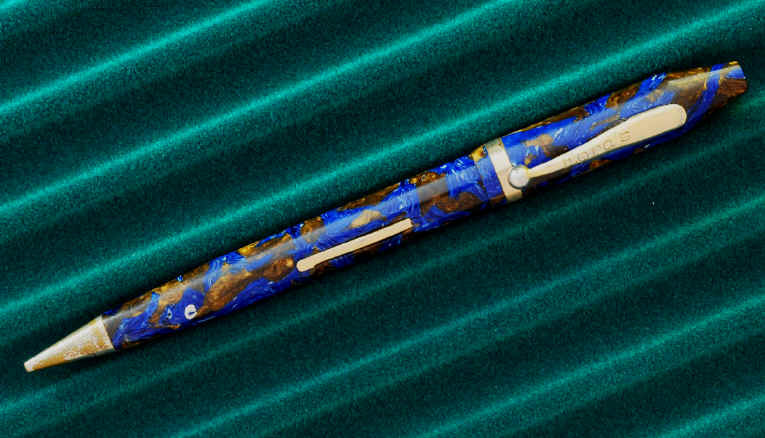 First, I got a "combo" fountain pen and pencil in blue and gold marbled celluloid. This has the same cap, section, and nib as the larger fountain pens above. More recently, I added another Ford's Jr. fountain pen, but this one is really different than any of those above. The body and cap are a different shape and it is, I believe, made from a celluloid tube rather than turned from stock. It is very thin and transparent. I don't know if this places it earlier or later than those above. This is not a picture I took, and there were ink stains in the cap which are now gone. I'll replace the picture later. The font on the clip is the same as the Ford's Jr. above.